Magiritsa is a traditional dish associated with the Greek Easter. So, for those of you celebrating Greek Easter this weekend, here is a recipe for it. Magiritsa is eaten to break the Fast before Easter and is prepared on Holy Saturday and eaten directly after the midnight service. 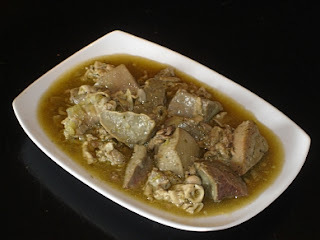 There are variations in the recipes used, but the recipe below (which is not a soup) is a simple, traditional way of preparing it - called Tsilihourdi - from a village in northern Corfu. Happy Easter - Kalo Pascha - to those of you celebrating this weekend! Use scissors to cut the intestine lengthwise. Wash and rinse it in water extremely thoroughly. Rub well with the rock salt. Rinse 3 times in separate basins of water. In the third basin, add the vinegar when you rinse it. Cut the intestine into 10cm pieces. Blanche in a pan of hot water for about 2 minutes. 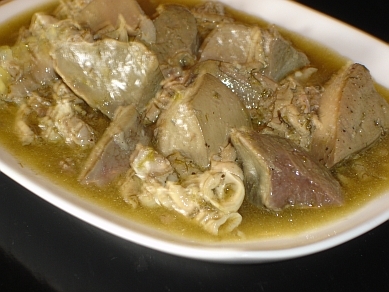 Rinse the offal well and blanche in a pan of hot water for about 2 minutes. Cut the offal into 2cm pieces. Put the intestines and offal into a pan along with the oil, garlic, salt and pepper and sauté for approx. 5 minutes. Add 500ml water and the dill. Simmer for approx. 1 hour until it is left with just the oil.